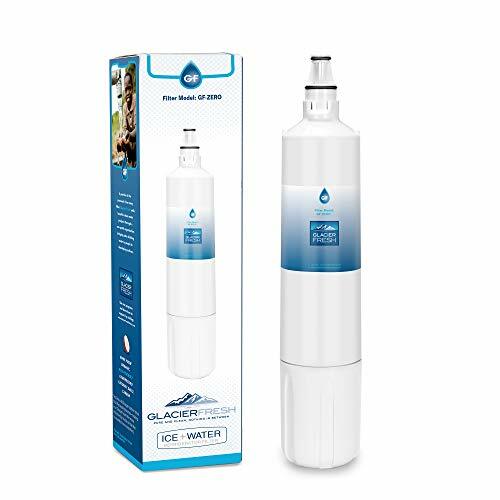 Glacier Fresh Sub-Zero Water Filter fits any refrigerator that currently uses the SubZero 4204490. Unlike other compatible filters, the Glacier Fresh filters are tested and certified by WQA (Water Quality Association) to meet NSF/ANSI Standard 42 for material requirements, so you can be assured of its quality. The Glacier Fresh filters are proven to perform just as well or better than the OEM filter. 1. Lift the top grille assembly to access the water filter cartridge. To lift the grille, pull out on the bottom edge of the grille and tilt the grille frame forward. 2. Slowly rotate the cartridge one-quarter turn counterclockwise to disengage. Gently twist until the cartridge is free from the base. DO NOT pull. There will be water in the filter cartridge, so it is normal for a small amount of water to spill out. 3. Line up the cartridge so that the locking tabs can be inserted into the filter head. 4. Rotate the filter cartridge into the base approximately one-quarter turn clockwise until it stops. DO NOT overtighten. 5. After the new filter cartridge is installed, the first full bucket of ice produced should be discarded. This will help clean the water system and clear air from the line. [NSF Certified]: Tested and certified by NSF International against NSF/ANSI Standard 42 for chlorine, bad taste and odor reduction. [Filter Life]: Enjoy fresh water by replacing your water filter every 6 months or 300 gallons, whichever comes first may vary with your water conditions. [Delicate Design]: The delicate design ensures it perfectly fits the original without water leakage. Easy for installation and operation. No tools required. [Quality Performance]: The advanced coconut carbon block filter can remove chlorine, bad taste, unpleasant odor and retain beneficial minerals in your tap water. [Compatible models]: Compatible with InSinkErator F-1000 & F1000, Sub-Zero 4204490, 4290510, PRO 48, PRO 48 with Glass Door, BI-36F All Freezer, BI-36U Over-and-Under Refrigerator/Freezer, BI-48S Side-by-Side Refrigerator/Freezer, BI-48SD Side-by-Side Refrigerator/Freezer, BI-36UG Glass Door Refrigerator/Freezer, BI-30U Over-and-Under Fridge/Freezer, BI-30UG Glass Door Fridge/Freezer, BI-42S Side-by-Side Fridge/Freezer, BI-42SD Side-by-Side Fridge/Freezer. Glacier Fresh is an independent brand. If you have any questions about this product by GLACIER FRESH, contact us by completing and submitting the form below. If you are looking for a specif part number, please include it with your message.